If you're looking for a four-door sedan with responsive driving capabilities, a lot of features and an attractive price, the Optima should be on your shopping list. It's handsome, offers impressive safety features and represents a good value for the money. Best little car I ever owned. My vehicle was bought from a loan company it had been repo'd from this lady and her son. The inside had a lot of damage but the car drove like a new one. The factory radio is awful that's the thing I hate about the car, however that is about the only thing I don't like about the car. The headlights are not that bright even when they are on high beam. I have hit 2 deer and the car still drives great. My car is automatic and manual I love that feature. The car is only a 4 cylinder but it will go really fast if I need it too, it uses very little gas on long trips and around town. My car was not built for comfort, while it is not uncomfortable to ride in around town it is not comfortable to ride in on long trips. I have never had any trouble out of the car mechanically other than replacing brakes and oil and transmission changes but that comes with the up keep of any vehicle. Over all I love my car I don't have any trouble out of it and it has never let me down. It always gets me wherever I want to go safely. Doing well for an older model. No major problems to report. I can feel when the car downshifts when dropping below 20 mph; however I have been assured this is not a concern and I have learned to adapt to it. The low tire light has come on more than once, though I cannot find any tire that seems below recommended pressure. A length of trim along the windshield has trouble remaining in place. Clear Coat is flaking off the door handles from frequent use. Driver's side mirror turn signal light is dim and/or flickers. Driving through large puddles will cause the power steering to fail temporarily. Don't let the low price fool you. Kia Optimas are great. 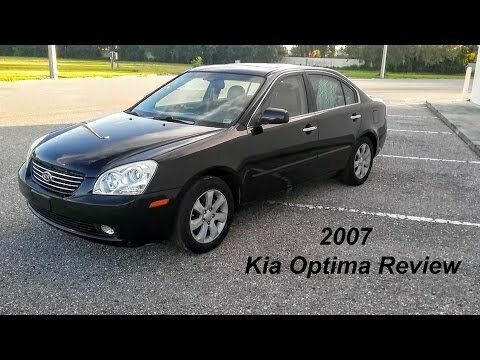 I love the reliability of the Kia, Optima. It drives smoothly. The trunk is huge and fits most double strollers! It requires very little maintenance. Plus, it is affordable. I don't like how long service takes when necessary. It wait about an hour and a half for an oil change. I also wish it had ac vents in the back; no one has ever complained of not being comfortable though.